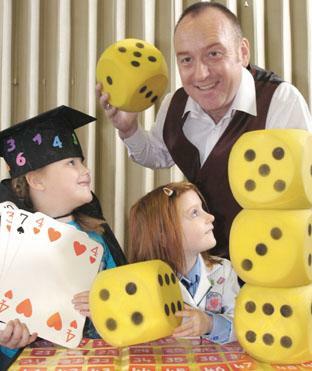 The maths magic shows focus on numeracy skills, calculation strategies, maths vocabulary and mental arithmetic. They are age appropriate and include tricks to cover repeating patterns, finding the difference, estimating, 2D/3D shapes, place value, times tables and partition skills amongst other topics. The maths workshops are ideal for KS2. Here the children learn a number of amazing mathematical tricks and how to present them to an audience, whilst gaining confidence with mental arithmetic. For KS1, maths workshops contain maths activities following up on one or more of the maths concepts or strategies explored in their show. 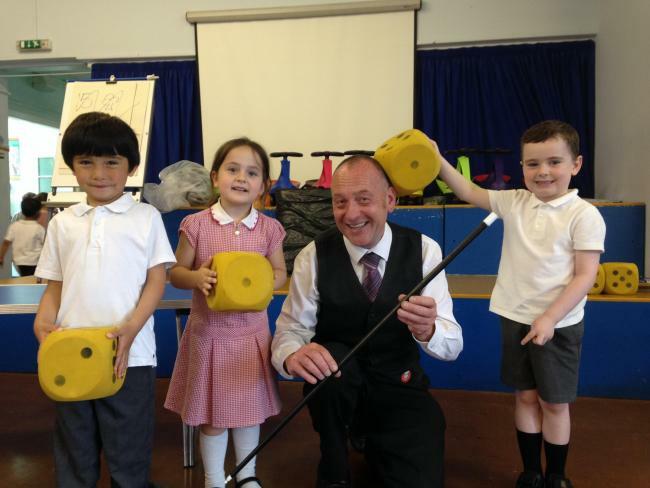 The KS1 and Foundation shows include magic tricks where maths concepts and vocabulary are explored, such as ‘finding the difference’ repeating patterns, sensible guessing, 2D/3D shapes, counting in 2s 3s 5s 10s, more/less than, positional/directional language, working at the appropriate level for their ages. Many of the tricks featured in the KS2 shows use appropriate maths learning such as recalling multiplication facts, and partition skills to work, and cover for example subtracting 2 digit from 3 digit numbers, place value, square/cube numbers, multiple step strategies and mean averages amongst others . The workshops are an opportunity for the children to learn some of the maths tricks presented in the show whilst practicing these skills. By far the most popular format is a day of shows and workshops, usually a morning of shows for EYFS, KS1, LKS2 and UKS2, followed by an afternoon of workshops for Yrs 5/6. 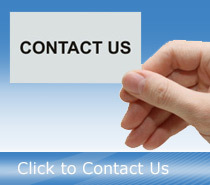 Of course there are many options and a package can be prepared to suit your school. A day of maths shows and workshops can be rounded off by adding a 45/60 min after school twilight session. The session normally starts directly after the school day, and the most popular format is where adults are invited to join pupils for an after school workshop. The focus is to promote maths at home, and the families learn and work on a number of tricks whilst having fun with maths. An alternative is a session just for teachers, sharing creative ways of teaching maths. They learn a number of conjuring skills useful for presenting magic tricks to class when exploring maths concepts with their children. There are often requests to tailor the general maths days to fit in with a particular area of maths a school is focussing on. It is always a good idea to ask if Tony is able to complement your focus and make the visit as relevant as possible for your school. A recent example of this was inverse operations, and normally these requests can be satisfied by adjusting the general maths days slightly. A couple of requests were so frequent or far removed from the normal content of a visit, new themed days to cater for them have been launched. A day where all the maths is applied to money. A typical day includes shows for KS2, KS1 and Foundation followed by workshops for year groups of your choice. The sessions are age appropriate and aspects of the topic explored include coin values, equivalent coins, comparing groups of coins, ordering money, counting money, choosing coins to value, adding and subtracting money, change, money puzzles and word problems all presented within magical routines and with plenty of fun. This day is mainly for KS2 and focusses on maths in the natural world. Included is fun with Tessellation, Mobius bands and Fibonnacci. 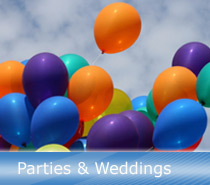 Once again a show launches the event then workshop activities follow up on the content of the show. Maths Inspiration Show/Workshops. A maths magic show, aimed at Yr 7 and modelling their learning, full of maths tricks and maths magic tricks. The follow up workshops give the pupils the opportunity to practise these tricks and hone their maths skills. Solving Probability Problems. Class size workshops with a few magical routines focussing on the topic of probability, including work with 2 way tables/sample space diagrams and probability trees with and without replacement. 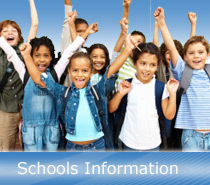 Details of prices, example timetables, previous customers, teacher resources and much more are available to view. “It was super to have content pitched so well at all the different primary age groups as well as having the adults in stitches on a regular basis. 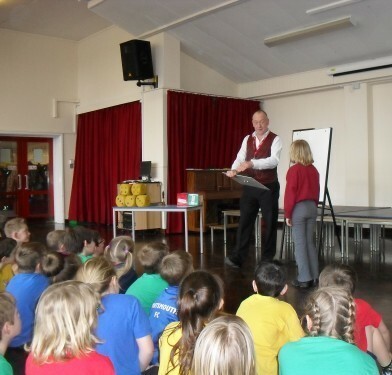 :)I sincerely look forward to booking your Maths shows again next year.” Clare Selby, St Augustine’s Catholic Primary School High Wycombe Buckinghamshire March 2010.